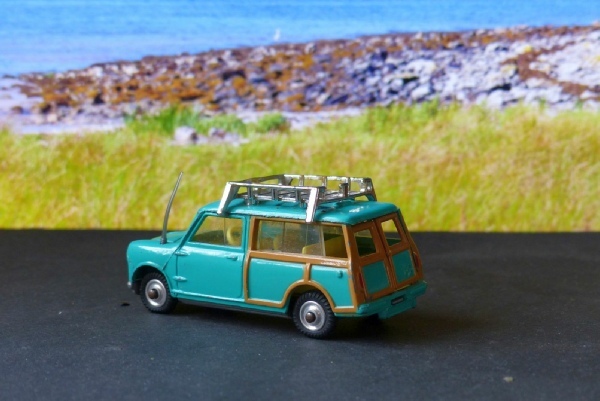 There were lots of minis and even a couple of mini vans but Corgi reckoned they needed another and came out with the Austin-badged Countryman. It is only in the summery shade of light turquoise and the box also contained two surf boards and a guy in swimming trunks. They’ve got lost in this case but the car has survived well. The interior is firm plastic, a nice change to the flimsy thin film of other issues. It’s a pretty model and not one you’ll see a great deal of as it wasn’t cheap with the extra bits and pieces and soon became superceded by the new minis, #334 with opening everything. It is totally original, with sound suspension and what I would guess are original tyres and aerial. The paintwork is excellent - just a few small marks on one side only. The jewelled headlights are fine and the roof rack chrome has survived very well. The rear doors both open and close properly. The windows and interior are very good indeed and this is one of the best I’ve had.